On October 17 in Bologna started another edition of SAIE the International Construction Fair. It is the biggest exhibition event in the construction sector in Italy this year. Yet again Drutex showcases its products at the prestigious exhibition. Visitors at the Drutex stand will see the proven solutions popular on the Italian market for years, such as Iglo Light or Iglo Energy systems, as well as our cutting-edge technologies, including windows made in the V-Perfect technology. This novelty in Drutex offer is a product that will definitely appeal to Italian clients since it stands out for a thin, aesthetic welding in the window angles. As a result, the windows look perfect. It is a great investment in elegant design. This modern system enables to connect the profiles adopting the shape welding technology. The Drutex stand also showcases window and door woodwork equipped with so-called smart solutions that allow to open, tilt and close the windows, doors and roller shutters with a remote control, a tablet or a smartphone. The over-150 meter stand of the Bytów company will also present large patio systems, such as Iglo-HS, as well as PVC, aluminum and wooden window and door systems. The SAIE exhibition is a fixed point among our foreign exhibition events. The company’s position in the Italian market, as well as dynamic growth of our sales network constitute an excellent proof that Drutex products dedicated to the Italian market are highly popular. Participation in the trade fair is an opportunity to showcase the extensive Drutex product range as well as to establish more business contacts. Each day we are gaining trust and appreciation of new partners that results mainly from high quality of the products, efficiency of operations and reliability, which motivates us to develop even more dynamically and to invest in Italy – says Adam Leik, marketing director at Drutex. Drutex exports already account for over 73% of total sales volume. Apart from Europe, the company offers its products also in the United States, Mexico, Australia and the Near East. Drutex has executed a number of prestigious investments all over the world, such as equipping with windows the New York Hilton, the Hyatt, the Holiday Inn or the Marriott, as well as a blocks factory and gold mine in Mexico. It Italy the company has been equipping with its woodwork residential constructions, as well as commercial, institutional and sports developments. Presence at international exhibitions is in line with the company development strategy and it additionally stimulates dynamic company growth and increasing the global market share. 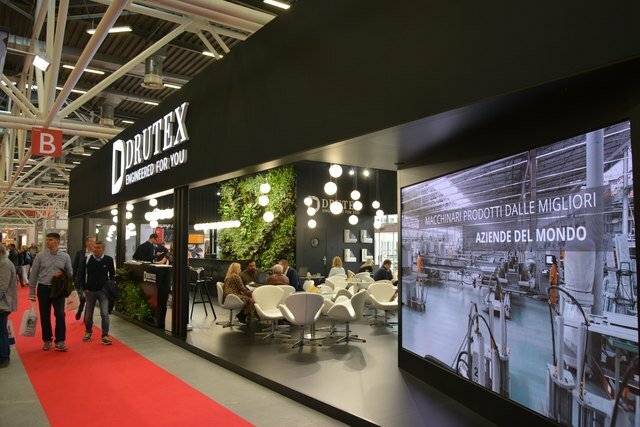 This year Drutex will exhibit also in Paris and in 2019 it will take part in trade fairs i.a. in Poland, Germany, Holland, Belgium, France, Italy and Austria.